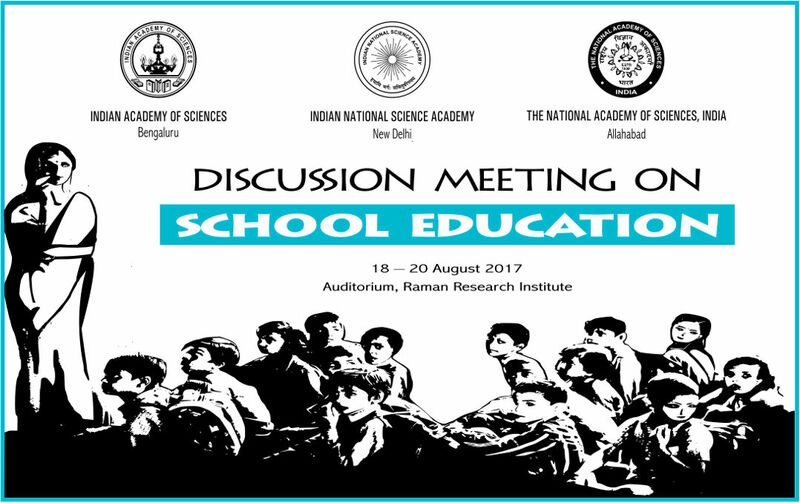 The objective of this meet, sponsored by the Indian Academy of Sciences and the other two national Science Academies, was to highlight some of the problems of School Education and offer suggestions for resolving them. All the issues have no doubt been discussed before, but there was room for a different perspective on some of them, and even if we are not able to offer a different perspective, it is good to add another voice to the efforts to be heard on the issues by the policy makers. The plan was to involve a number of school teachers in the exercise – many conferences that deal with education policies seem to be meetings of people into the management of education rather than teachers who do actual classroom teaching. Each teacher participant served on one of the panels, voicing issues from the teachers' perspective. The meeting comprised 5 three-hour sessions, two sessions a day a day followed by a concluding session– summarizing the major points raised in the meeting. A report will be submitted to the Indian Academy of Sciences and other sponsors. The conference was aimed at deliberating on the following issues. Role of the State: The Indian state over the years has not given the required attention to education at the school level. This has of course been talked about in different forums but with little practical effect. The situation, if anything, seems worsening with the state wanting more private initiatives rather than enhancing its own efforts. Curriculum and pedagogy: The school curriculum is heavy in practically all boards. This in itself promotes memorising over thinking and assimilation. (On the other hand, under-graduate curricula seem to be much too light in general). History and geography curricula for school children seldom expose them to the history and geography of regions beyond the Indo-Gangetic plains and their own region. A better exposure to all the regions in the country through text books would surely help in ridding our future citizens of the kind of prejudice we witnessed recently against people from the North East. There are of course many other issues which need to be highlighted in this connection, but these two have not received adequate attention. Quality and Assessment: Teacher quality on the whole as of now is unsatisfactory, to put it mildly. In the longer run, this can be addressed only through raising the status of teachers in our society. However, there is the problem of improving the quality of the existing human resources. The teacher-training programmes run over the last several decades seem to have had at best marginal effect. This is perhaps because of an inadequate appreciation of what underlies this lack of quality: the underlying problem is that with many of our teachers, the real difficulty lies in the fact that their knowledge of the subject they are supposed to teach is less than satisfactory; worse, their ignorance is sometimes such that they do not know that they do not know. In such a context, the training needed is to ensure that they acquire the necessary knowledge. Communication skills while important necessarily come after the acquisition of something to communicate. Recent directives to schools seem to want to practically eliminate any assessment until reaching the end of the 10th standard. While evaluation methods need reforms, total elimination of assessment will certainly not help in ensuring good standards. The proliferation of entrance tests to undergraduate institutions is a clear indication of the distrust of the assessment methods current ion our school system. The humanities, sciences and society: There is, in general, a greater emphasis on science as compared to humanities in our school education. This is, no doubt, the result of the fact that most parents want their children to eventually study engineering or medicine which will assure them of well-paid jobs. There is a crying need to ensure that humanities are given greater importance than is the case now. The mind-set that the sole purpose of education is to ensure lucrative employment has to change. Right to education and inclusion of all: The goal of universal education can be achieved only if the state takes a much greater interest in education than it currently does. And the right to education will be meaningful only if free good education is on offer to children from the economically weak sections. We simply need many more schools to meet this goal and good schools at that. The children from economically backward (and that includes most of the socially backward) sections of our society are the ones who need good schools badly – the ones from 9upper) middle-class families have the kind of support at home that can make up for the inadequacies of their school.